This luscious “Black Gold” Chocolate Cookie recipe is adapted from chef and cookbook author Marcel Desaulniers. It is perfect for chocoholics who like a double dose of chocolate – in this case, in the dough and in the added chips. Preheat the oven to 325º F. Line two baking sheets with parchment paper. In a medium bowl, combine all-purpose flour, baking powder, and salt. Set aside. In a microwave-safe bowl, combine 6 ounces semi-sweet chopped baking chocolate pieces and the chopped unsweetened chocolate. Cook on high 1 – 1 ½ minutes until melted, stirring every 30 seconds. Place the butter in a separate microwave-safe bowl. Cook on high 30 seconds to 1 minute until melted. Combine together melted chocolate and butter. Stir until smooth. Set aside. In a medium bowl, using an electric mixer on medium speed, beat eggs, sugar, and vanilla extract together for 4 minutes. Scrape the bowl and beat for 2 more minutes. Add melted chocolate mixture and beat together for 1 minute until combined. Reduce speed to low and gradually stir dry ingredients into the chocolate mixture a bit at a time until well blended. Add remaining chopped chocolate to the dough, mixing in by hand with a wooden spoon. Drop rounded tablespoonfuls onto prepared baking trays, 1 ½ - 2 inches apart. Bake 10-12 minutes until cookies are set. Remove cookie sheets from the oven. Allow cookies to cool to room temperature before removing them from the trays to transfer them to a wire rack. Cool completely. 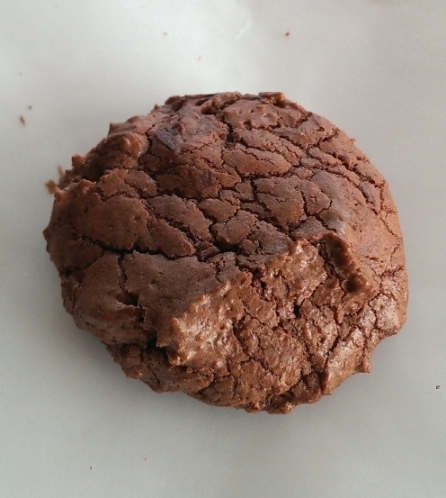 You will find you cannot make this “Black Gold” Chocolate Cookie recipe just one time. As you make separate batches, experiment with different brands of baking chocolate – and even various combinations of semi-sweet, bittersweet, and unsweetened baking chocolate – to suit your taste. These cookies do not spread much when baking, so you may find you can space them closer together than most drop cookies.